Simple paper overlay to convert your speedometer to read out in metric kph. When cleaning the gauges on my 1966 MGB, I discovered that what I thought was a metric Smiths speedometer was actually just a printed piece of paper glued to the face! It had me fooled, and seemed like an clever and inexpensive way to convert a speedometer from miles to kilometers. So, I scanned the paper overlay and cleaned up the image a little in case it's useful to anyone else. If you require a metric speedo for importation, licencing etc, just print this out, cut it out and stick it to the face. It may take some playing with your printer settings to get it to print at the right scale. Here's how it looks installed. Looks pretty good to me. Thanks to Chris Williams for cleaning up the graphics and adjusting the scale. 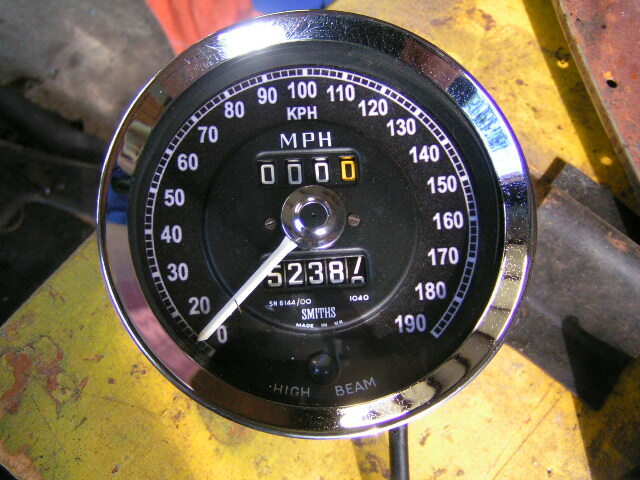 Comments on "KPH Speedometer Conversion"
I am a Dane who is very interested to read your article about the speedometer conversion as I have bought a MGA 1600 Mk 2 from the U.S.A As you know we have kilometres scale over here, and I have not been able to buy any speedometer at all,so I hope you will put on the article again,so I can imitate your idea. I think it is possible to an instrumentmaker in Denmark to make the final conversion. is alowed on the road. thanks ! Nice and simple idea! I'll have to try this myself. speedometer from miles to KPH. I´m grateful,thank you very much. Thanks for the info! Now I won't have to squint at the speedo....! I live in Korea and we are a metric nation so I really needed a metric overlay. Thank you for sharing this with us. I purchased a conversion on ebay but of course it did not work. Now I can take your printing and modify its size to my speedometer.